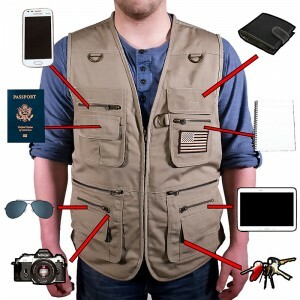 The 22 Pocket Sportsman Travel Vest is the perfect vest for Travel, Hunting, Fishing, Rock Climbing, Photography, Journalists, Safari, and any other outdoor activity! Our 22 Pocket design easily lets you carry your wallet, camera, keys, phone, utility knife, notepad, flashlight, and any other items you might need throughout your travels. Our vest is tightly stitched and has a heavier weight than our competition to ensure it is long-lasting through the toughest situations. D-rings are attached to the front, which conveniently hold fishing lures, glasses, pens, and other accessories. Backed by our 1 year manufacturer warranty for craftsmanship!